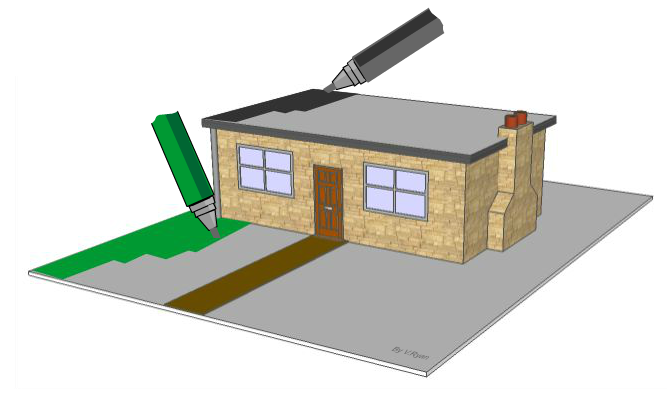 Drawing a single storey house with a flat roof is not difficult when using two point perspective. Detail such as brick work, window frames, grass, trees etc.. can be added to make the drawing more artistic.The stages are shown below. 1. Draw two vanishing points an horizon line and a vertical line that represents the basic height of the building. 2. Draw the two plain sides of the building. 3. Draw the two windows in position, remember to project lines back to the vanishing point on the right. 4. Add the door including the small glass window. Take care to project guidelines to the right hand V.P. 5. Add the flat roof projecting lines to both the right and left vanishing points. 6. Add the basic layout of the path by projecting two lines from the left V.P. through the front door. 7. Add more detail to the path at the front of the house.